Doha is gathered around its bay, but intelligent city planning has kept buildings away from the water’s edge, allowing great views. To get around, use taxis, which are good value, comfortable and available at most tourist stops. Start at the I M Pei-designed Museum of Islamic Art (MIA) on the waterfront. The pyramid-like structure has cool, airy interiors that look out on to the bay and along the Corniche. Open since 2008, it has a stunning collection of pieces dating back more than 1,400 years. A flagship project of the Emir of Qatar, Sheikh Hamad bin Khalifa Al Thani, it is probably the leading museum of its kind in the world, with 3,800 sqm of gallery space housing hand-painted ceramics, textiles, manuscripts, jewelled artefacts and scientific instruments from countries including Egypt, India, Iran, Turkey and Syria. It also has temporary exhibitions. The newer MIA Park, adjacent to the gallery, offers 27 hectares of green space against a backdrop of the stunning Doha skyline. Take a stroll and you’ll see Richard Serra’s towering 24-metre steel sculpture, Seven, the artist’s first public work in the Middle East. If you need further evidence of how Qatar invests for the future, you’ll find it in the way it has recreated its old-style marketplaces of the 19th century, located just over 1km inland from the museum. Souq Waqif was restored to its former glory as recently as 2008 and, like Souq Al Ahmad, makes for an entertaining place to spend a few hours in the evening, preferably with a good meal at one of its many restaurants. But it’s not just tourists that hang out here – many locals and expats come to shop, too, be it for jewellery, perfume and spices, or pots and pans. If you want to soak it up, stay at one of the new Souq Waqif boutique hotels (there are several), which offer five-star air-conditioned accommodation. Qatar is spending big in preparation for the 2022 FIFA World Cup, with some US$20 billion committed to improve its tourism infrastructure, including a new Doha Metro and extensive hotel development. Stand on the 7km stretch of the Corniche and you’ll see the distinctive outline of the Sheraton, which was Qatar’s first internationally branded hotel and is about to reopen next month after an extensive renovation. The Corniche is a good place to take the measure of Doha – its sculpted grassy verge even has a giant oyster shell containing a pearl on it, a reminder of the country’s roots. The best time for a stroll is after 8pm, when Qatari families arrive, set up their picnic chairs and relax in the cool air. Traditional wooden fishing dhows bob around in the harbour, framed against the modern high-rise hotels at the northern end. 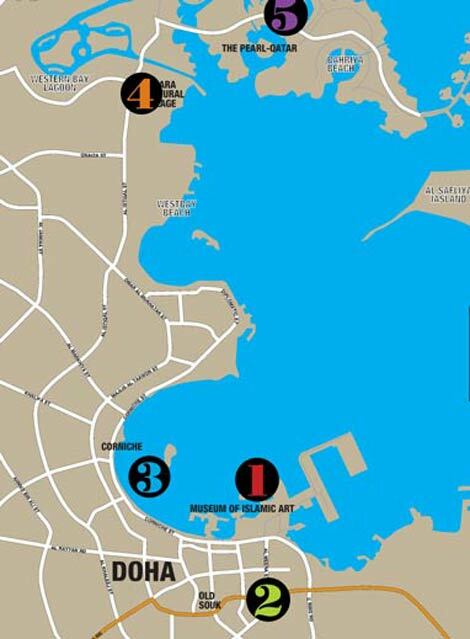 About a ten-minute taxi ride from the Corniche is the Cultural Village, which opened in 2010 with the intention of positioning Qatar as an “international cultural lighthouse”. It has an array of attractions, such as the Qatar Philharmonic Orchestra, an opera house, a theatre, art galleries and a 5,000-seat outdoor amphitheatre. This multibillion-dollar manmade island – located 350 metres from West Bay Lagoon and shaped like a cluster of oyster shells – is one of the very few places foreigners can buy property in Qatar. Organised around a central marina, it’s a one-stop shop for boutiques, restaurants and Ferrari-spotting (there’s a showroom here, and plenty of residents seem to have bought). Its 400 hectares include themed districts and lots of high-end townhouses, apartments, penthouses and five-star hotels, including the soon-to-open Marsa Malaz Kempinski (kempinski.com).